Personally, I don’t need much of an excuse. Autumn Means Pumpkin Recipes ! Pumpkin flavors and the fall season just go hand in hand and I just love it! Don’t get me wrong- Blueberries, raspberries, strawberries and blackberries are all nice and everything. However, as the heat starts to decrease and the jackets start to come out of hibernation, so do those glorious bowls of beta carotene. Some of my all time favorite recipes are pumpkin inspired including our favorite Impossible Pumpkin Pie Cupcakes and Pumpkin Cheesecake Balls! So….are you guys ready for pumpkin season? 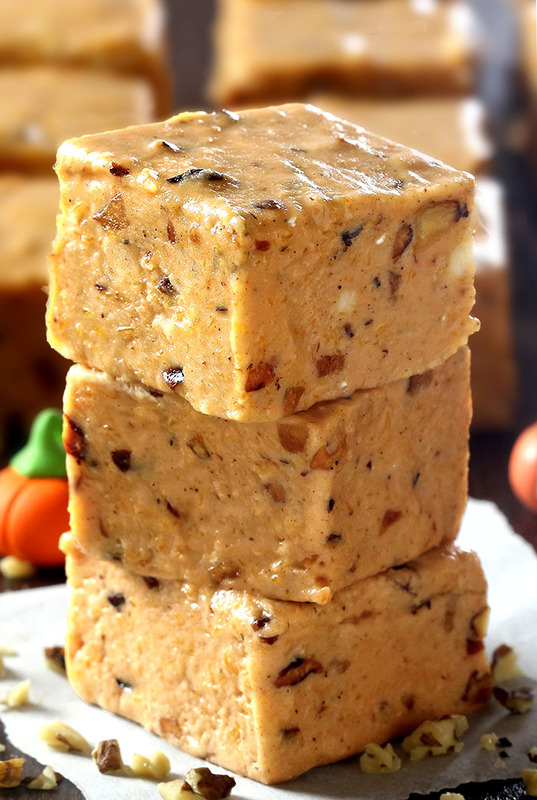 I sure hope so because today we are sharing the BEST Pumpkin Pie Fudge recipe. It is a fall MUST ! When you smell pumpkin pie spice at our house, you know it is fall, and that is a very good thing! If you’ve never made basic fudge before, would you believe me if I told you it would take you less than 10 minutes to whip up a batch? Honest! And make endless variations! I like it because it requires no special equipment or ingredients — just sugar, milk, butter and a variety of other ingredients, most commonly, chocolate or pumpkin. Even a candy thermometer is optional, but it is highly recommended, since You have to control temperature to make successful fudge. The ideal cooking temperature for fudge is around 235 to 239 °F, there is just enough water left in the syrup to ensure it is not too hard or too soft. Too cooked fudge was cooked to a temperature of 244 °F. At this temperature, the sugar is too concentrated and the result is hard and brittle fudge. Undercooked fudge was cooked until the temperature reached only 226 °F. At this temperature, the sugar is not concentrated enough and the resulting fudge is soft. Look for recipes that call for corn syrup, marshmallows, or marshmallow crème. These ingredients prevent crystallization of sugar into large grains, so the texture of the fudge will remain smooth. 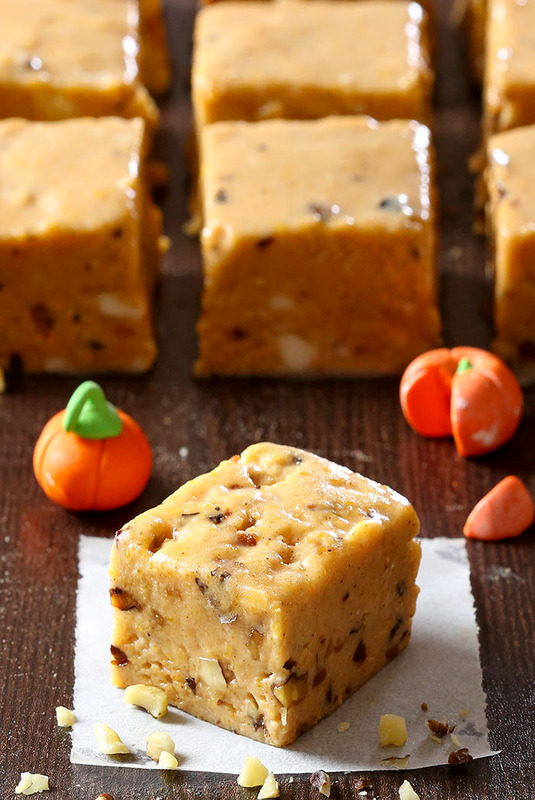 How do you make Pumpkin Pie Fudge? 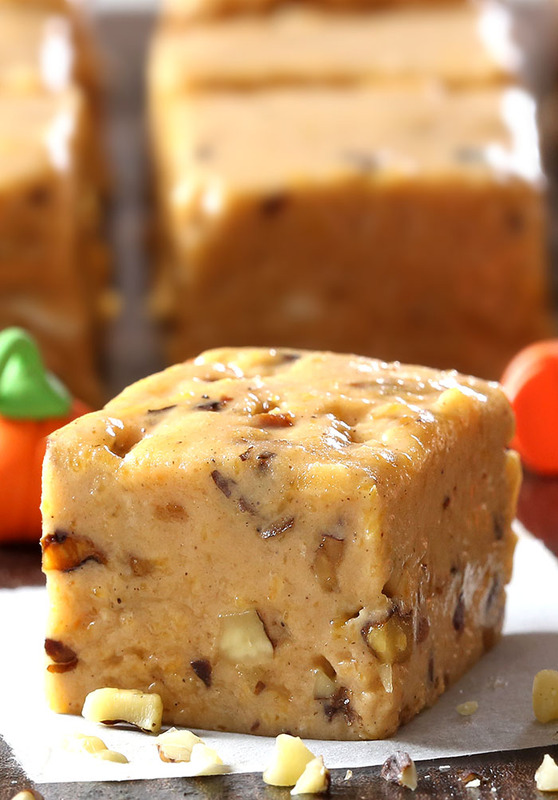 Combine the evaporated milk, marshmallow creme and white chocolate chips/chunks to make this a super creamy fudge. If you don’t want any visible chocolate, I’d recommend chopping your white chocolate before adding (My family enjoyed the little bits of white chocolate interspersed in the fudge). Throw in pumpkin and pumpkin pie spice, and you have the fudge equivalent of pumpkin pie. As tempting as eating a whole batch of fudge can seem, it’s probably best to store some of it for later. Whether home-made or store-bought, fudge has a relatively long shelf life. Wrap the cut pieces in parchment paper and store in an airtight container at room temperature from 7 – 14 days. 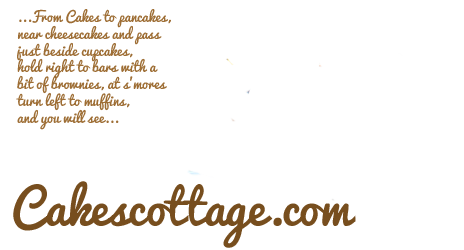 Fudge can also be stored in the refrigerator wrapped and in an airtight container from 2 – 3 weeks. 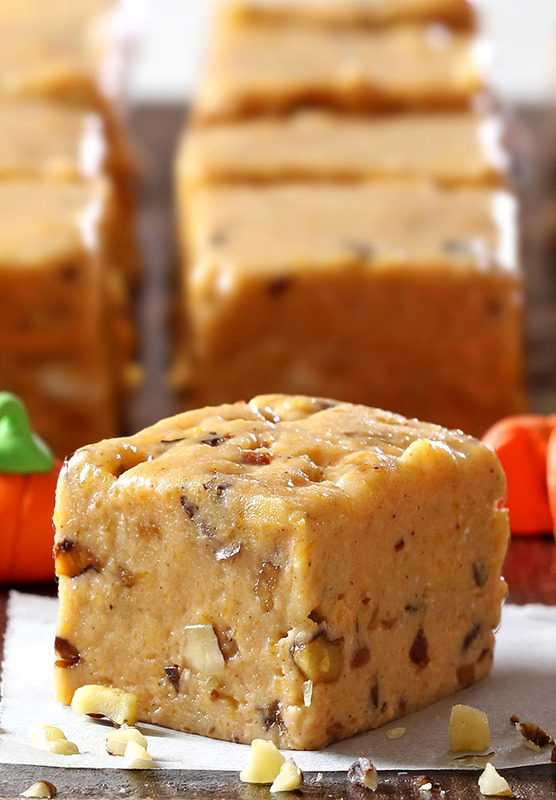 It's no trick – Pumpkin pie fudge is a quick, easy recipe that’s great to bring to a Halloween party, tailgate party or even Thanksgiving. Line a 9x9 inch pan with aluminum foil (makes it easier to lift fudge out of the pan for cutting). Butter the foil or spray with cooking spray and set aside. Place butter, evaporated milk, sugar, pumpkin, corn syrup and spices in a medium saucepan. Bring to a full boil over medium heat, stirring constantly. Boil, stirring constantly, for about 10 minutes or until candy thermometer reaches 234° to 240º. Once mixture reaches 234°, remove from heat and quickly stir in remaining ingredients until well blended. Pour into prepared pan. Let stand 2 hours or until completely cool. 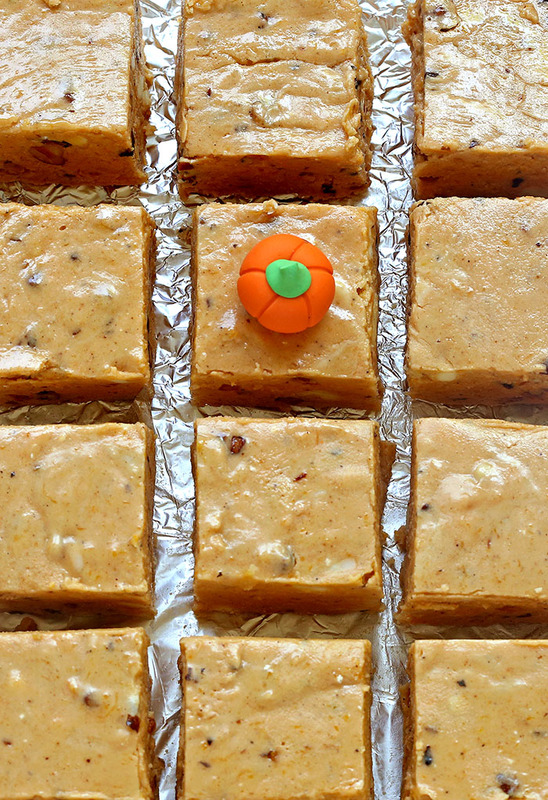 Cut fudge into squares. Cover tightly and chill for up to 1 week. Do not freeze. * For thinner fudge, you may use a 9 x 13 pan. 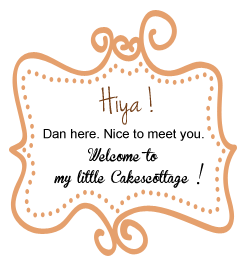 * The fudge mixture should reach 239 degrees F (115 C) before you remove it from the heat. The temperature will continue to rise slightly, even off the heat. 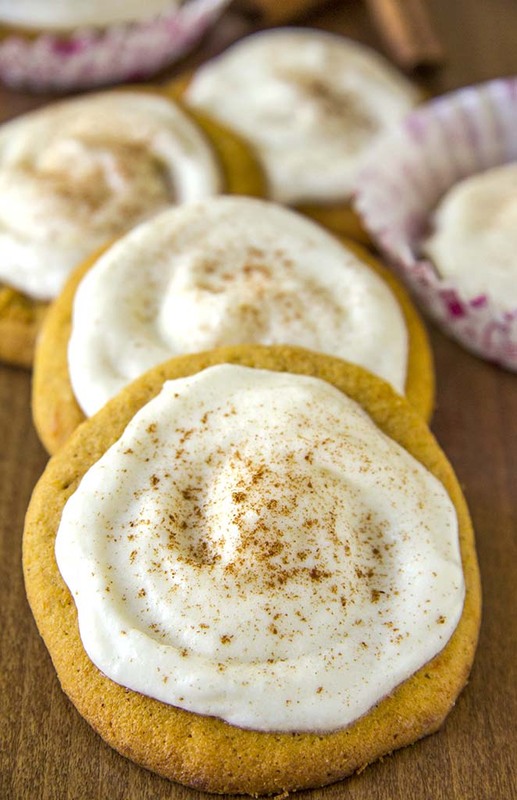 These melt-in-your-mouth pumpkin cookies are a MUST try this fall! 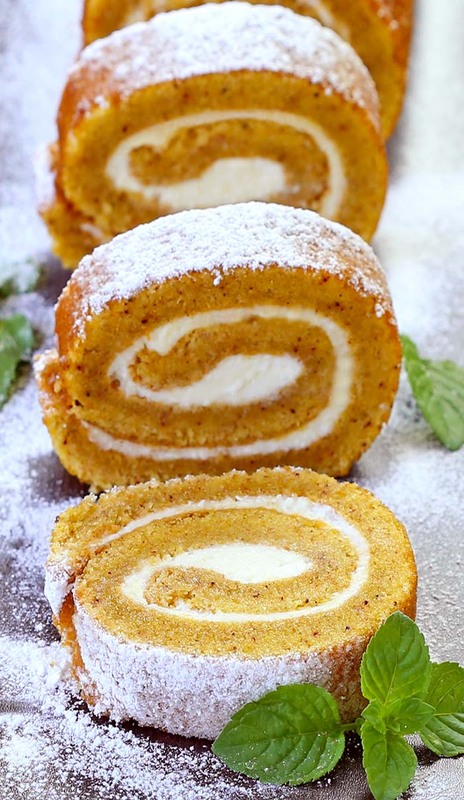 Nothing speaks fall more than a pumpkin roll. The moist pumpkin-spiced cake is filled with soft, sweet cream cheese. Perfect for Thanksgiving, which is not to far and never too early to start planning for.